Beautifully handcrafted with delightful attention to detail, Jim Shore's charming miniatures capture the essence of the beloved Disney characters. Depicted here is an adorable Thumper from the classic Bambi film. Made from resin. Packed in a branded gift box. Unique variations should be expected as this product is hand painted. Not a toy or children's product. Intended for adults. Disney Traditions Bambi Thumper Mini Figurine is rated 5.0 out of 5 by 4. Rated 5 out of 5 by Anonymous from This product is so beautiful. A beautifully detailed item from Disney traditions. 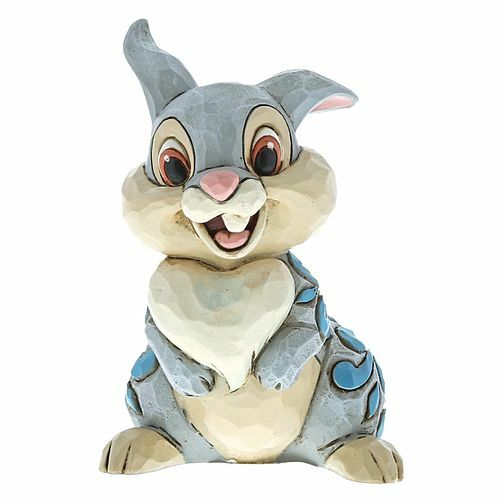 This was bought as a gift for my daughter who loves Thumper, this figurine captures every detail correctly and is so cute. the pattern on the back is very complimentary and gives it an authenticity. I initially bought my other daughter Cheshire Cat from Alice in Wonderland and when I seen just how charming he was it was a must to buy another. delightful additions to our Disney products that make a lovely little ornament in any room.